Regal Dole Cannery Stadium has been filled with teenyboppers eager to see "Hannah Montana & Miley Cyrus: Best of Both Worlds Concert." 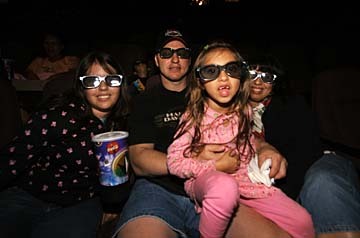 Donning their 3-D glasses, above, are Audry Sena, left, 16; her dad, John; Jennifer, 6; and mom Ana Sena. John just returned from serving his tour in Kuwait, so this outing was a special "Dad's date" that Jennifer requested. SPOILER ALERT! If I had a red flashing light, I'd use it. Get this: About halfway through "Hannah Montana & Miley Cyrus: Best of Both Worlds Concert," we discover -- drum roll, dramatic music, the hosanna of angels -- that Miley Cyrus and Hannah Montana ARE THE SAME PERSON. All it takes is for Hannah to doff her straight blond wig and let her 15-year-old freak flag fly, consisting of rather dark curls. Apparently, the blond wig is as effective as Clark Kent's horn-rims in maintaining a secret identity. Are you with me so far? Because I'm not sure myself where I'm at, as unscrambling this convoluted hodgepodge of reality and fiction and marketing hype is like trying to juggle Jell-O. There is a real young lady named Miley Cyrus, whose name is pronounced like "smiley virus," which, now that I think about it, is a pretty accurate label as well. She is a wee teen, all legs and elbows and grinning head and unbottled energy, and has a passable singing voice and an engaging personality. She is the daughter of Billy Ray Cyrus, a midlevel country singer and occasional television personality. Miley plays a teen named Miley on a TV show, and her dad plays her dad, also using his real name. Here's the twist, kids: The fake Miley has a secret career as megastar singer Hannah Montana, whilst maintaining a secret identity as a student, and her dad is in on it, somehow. The whole thing is a concoction of the Disney child-star factory that spews out cloney kid stars that wind up, in their latter years -- like, their 20s -- being Britney Spears. Miley's summer tour last year, playing live to hordes of bleating scream tweens and their desperate, bewildered parents, was a financial sensation. The frozen head of Walt Disney is now excessively insulated by yet another mountain of dollar bills. Let's recap: Little Miley is a juggernaut, like a dark star bending light and gravity, and yet unseen by anyone over age 12. Watch out! Nine-year-old Micaela Wagner, left, and her sister, Michelle, 7, said they loved the movie. Which is why, feeling rather like a perv and glad he wasn't wearing an overcoat, this dumbfounded and rather-too-old-for-this newspaperman found himself wearing 3-D glasses in an audience with demographic charts well below the introduction of hormones. 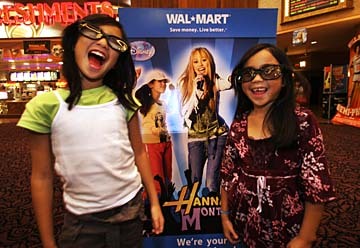 The "Hannah Montana & Miley Cyrus: Best of Both Worlds Concert" was captured on film and given a limited release, which has been expanded, thanks to larger-than-expected box office. And it's all in three dimensions! Director Bruce Hendricks, a master at 3-D filmmaking, manages to capture the spirit and the rush and the awesome staging of the concert rather well. The theater sound system also seems tarted up. It all costs a bit more than the average ticket, even factoring in the cost of the special eyeglasses. It's essentially a filmed concert, excruciatingly choreographed to the last detail by stager Kenny Ortega, who's likely the unsung hero of the piece. The staging, which includes enormous cubes of projected video, looks rather amazing, and the 3-D movie really does it to a treat. Makes me think most major concert tours should be archived like this. Stop-and-go 2-D segments were shot backstage, during rehearsals, where I was glad to see that putting such a show together takes months of labor and difficult craftsmanship, and that Miley, the moment things don't go her way, starts yelling for her mother. The music all sounded like crunchy pop, catchy and up-tempo, and all produced like Kim Wilde's "Kids in America" several decades ago. But the kids in the audience seemed to know the words and had no restraints about singing along. I heard one afterward point out that Miley changed outfits for every song, something this fashion-addled writer completely missed, or maybe the "fashions" were too similar. Miley also shows off her songwriting ability with a tune about how she misses her grandfather, entitled "I Miss Him," and the chorus goes "I miss him / I miss him / I miss him / I miss him / I miss him ..." Well, it's the thought that counts. In the middle, while Miley/ Hannah is changing her wig/ identity, the Jonas Brothers -- three cookie-cutter kids with curlicue hair -- play a couple of tunes and the 3-D aspect works really well here, cutting not just back and forth, but in and out. What are we to make of this? The movie is actually enjoyable, mostly on a technical-wowness level, and has the good sense to bow out before the sameness of the songs and performances start to create a 60-decible hum in your head. As for Miley herself, she seems like a nice kid. She might not become another Britney, if she keeps away from those way-cute Jonas boys. They look like trouble. I think they've actually experienced hormones.